This tutorial is an introduction to the Skype for Business to Microsoft Teams upgrade journey and our end-to-end upgrade success framework. This tutorial will quickly orient you to the recommended upgrade paths and resources available to support you in your journey, whether you’re just getting started with planning, already running Teams alongside Skype for Business, or ready to upgrade to Teams. This tutorial includes links to existing content to help connect you with the latest, most up-to-date information. For an optimal learning experience, follow the links to learn and apply. If a link is labeled as “additional information,” you can consider it optional. An IT pro responsible for planning, deploying, or managing Skype for Business. Responsible for planning user change management within your organization. Interested in understanding how to approach a successful upgrade from Skype for Business to Teams for your organization. We’ll go into detail about how these two products come together and explain what steps you can take today to prepare an existing Skype for Business environment for Teams. We’ll discuss the framework to help you plan and execute your upgrade, with an overview of the key activities to drive an optimal experience across technical and user readiness. Explore the upgrade paths available to help you plan your upgrade. Learn the critical steps required to prepare for and implement your upgrade. Identify deep guidance, templates, and resources available to help you in your journey. Share next steps to get started using our guidance. Learn about the latest released features in the Release Notes. Participate in the Microsoft Teams technical community to get your feature questions answered. If you have any questions or feedback about this training, please post in the comments section at the bottom of the “Next steps” page of this tutorial. To give us product feedback about Teams, such as ideas for new features, please visit UserVoice. We also recommend reading the FAQ - Journey from Skype for Business to Microsoft Teams (estimated reading time 10 minutes) to get a deep understanding of the most commonly discussed topics. Designed for smaller organizations or those using Skype for Business Online for IM (chat) and meetings only, the Upgrade Basic checklist is an accelerated action plan that includes core, recommended activities and associated resources for implementing a successful move from Skype for Business to Teams. These ten easy steps provide everything you need for a successful upgrade. They’re designed to be completed in about 30 to 45 days, but you should adjust task completion dates based on your organization’s upgrade schedule. Designed for larger organizations or those with complex deployments of Skype for Business (for example, hybrid or cloud voice deployments), Upgrade Pro accounts for a longer upgrade lifecycle along with a variety of upgrade scenarios, including running Microsoft Teams alongside Skype for Business until Teams is ready for your organization. Pre-upgrade: Start realizing the value of Teams as you prepare for your upgrade over time. Consider these steps an upgrade prerequisite to help ensure a positive experience as you transition to Teams when it’s ready for you. If your organization has already been running Teams alongside Skype for Business, use these pre-upgrade activities as a validation checkpoint for your organization’s readiness to upgrade users to Teams. Upgrade: When your organization is ready for users to stop using Skype for Business, you’ll want to ensure they have ample notice to get training and start using Teams (if they haven’t already). You’ll also want to take steps such as moving their Skype for Business meetings to Teams to ensure an optimal experience. Post-upgrade: After your entire organization is on Teams, implement a plan to maximize value. This includes monitoring your network for quality, promoting adoption of Teams while ensuring that Skype for Business usage is winding down, and planning for expanded functionality as the Teams roadmap continues to evolve. As in every project, it’s always a good idea to have a plan in place to set yourself up for success. For the upgrade, the planning phase includes the following two components: Enlisting your stakeholders and defining the project scope. A sponsorship coalition that includes executive and project sponsors who have a vested interest in and influence on the project’s success. The project team, consisting of the people responsible for ensuring technical and user readiness, who will complete the various tasks in the project plan. The common thread between these two groups is the project manager, who works to ensure that project tasks get completed on schedule and reports project status back to the coalition. Optionally, you can create a steering committee. Sometimes large or more complex projects end up with conflicting or fragmented leadership roles, resulting in disconnects among the stakeholder groups. For these projects, you might want to form a steering committee. A steering committee is responsible for driving decisions, providing strategic oversight, supporting the project’s initiatives, and—when necessary—removing blockers. Taking time to define your project vision, scope, goals, and governance will help ensure all project stakeholders are aligned and working toward the same end results. This is especially critical given that the technical readiness team and user readiness team will be working independently to pull their respective pieces together while remaining tightly aligned on needed capabilities, business scenarios, and project timelines. After you complete the project scope, refer to it throughout your project to ensure you’re on track to achieve the end state you wanted. Use the goals that you identify below to measure against your outcomes and mitigate as needed. Project vision: The “big picture” or eventual end-state that answers the question, “Why are we doing this project?” An ideal vision addresses your organization’s business drivers and user value-add perspectives. Project scope: Your vision might only be realized over time, through various phases. The project scope defines the focus of your project at this time and serves to keep your project team focused on their current tasks, enabling you to realize your long-term vision. Project goals: Your goals define the outcome you want and enable you to measure the success of the project. Goals can be defined as objectives and key results (OKRs), and the measures of project success can be defined as key success indicators (KSIs). It’s essential that you get full participation from project stakeholders in defining OKRs and KSIs, to help ensure they feel a sense of ownership and align these measures of success to defined project tasks. Goals should include a mix of organizational, technical, and user-focused success measures. Define your project scope for examples on vision, scope, and goals. The actual migration from Skype for Business to Teams can be conducted with different approaches. Please read Migration and interoperability guidance for organizations using Teams together with Skype for Business (estimated reading time 19 minutes) to understand the concepts, the available settings, and considerations that you need to take into account. Skype for Business and Teams both offer you real-time communication based on the same technology. The quality of your audio and video calls will directly affect user experience, and both heavily rely on network quality. Any improvement you can make today to network quality for Skype for Business will directly benefit the quality users will experience on Teams. Therefore, we highly recommend optimizing your network for Skype for Business to make your users (even more) happy today and give them a great start on Teams from day one. You should perform a Network Readiness Assessment before deploying any real-time communications product such as Skype for Business or Teams, then run it on a regular basis afterwards. If you haven’t conducted a network readiness assessment at all or in quite some time, you absolutely should do so before introducing Teams. The Network Readiness Assessment focuses on network performance, network planning, and other general networking aspects such as ports and protocols that must be opened. Even if you’re currently using a real-time communications product, such as Skype for Business, the Network Readiness Assessment will help validate your network readiness. Make sure that your current Skype for Business deployment meets the quality bar when it comes to real-time media. Use Call Quality Dashboard (CQD) to monitor usage and identify quality trends, and Call Analytics to troubleshoot or look at quality indicators of individual calls. Organizations should identify a person, or group of people, for the role of Quality Champion. The quality champion reviews quality metrics against usage, identifying quality trends and areas for improvement. The quality champion is the go-to person for any call-quality related issues and should act as the subject matter expert (SME) for the identification of quality issues by reviewing ongoing usage and quality trends and identifying action items. The quality champion should work with the respective teams to drive remediation actions, reporting to a steering committee on the progress and open issues. The best candidate for the quality champion is typically the customer service owner. Depending on the organization size and complexity, any person who is passionate about user experience and has the skills to identify trends can act as a quality champion, supported by the right level of sponsorship to work with other teams to drive remediation. As we’ve already mentioned, Teams leverages existing Office 365 infrastructure. Be sure to meet all requirements—for links to detailed information, see the list below. To learn more about Call Quality Dashboard, watch our CQD videos. 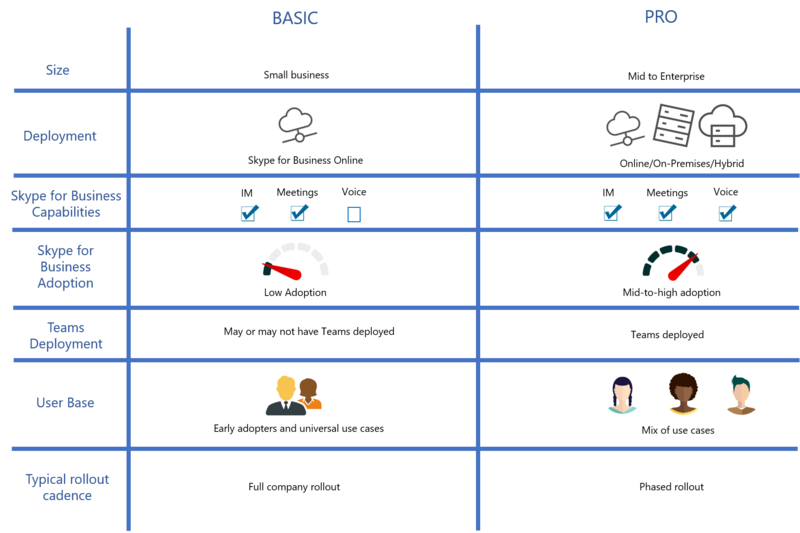 Assessing organizational change readiness: This includes understanding who your users are, how they’ll use the new technology, and how readily they adapt to change. This is also an opportunity to identify specific user profiles who would benefit from focused onboarding. Read Assessing organizational change readiness (estimated reading time 9 minutes) to learn more. Defining and prioritizing high-value business scenarios that will provide clear value to the organization is essential to materializing real change. This involves getting feedback from selected portions of your user community about how they’re currently collaborating and communicating, and identifying their pain points. This will provide you with a map of the scenarios that can be improved as you make the transition to Teams. Preparing a user readiness plan: Consisting of awareness, training, and support activities, your readiness plan should address both your broad user base and targeted profiles, as identified in the assessing change readiness activity. Read Preparing a user readiness plan (estimated reading time 2 minutes) for more details. After you’ve verified that your environment is ready to run Teams, you can start a Teams pilot. Skype for Business and Teams offer overlapping functionality— that’s why it’s helpful to start your journey with a pilot. The pilot is a small-scale deployment that lets you validate the interoperability with Skype for Business in your environment, in addition to understanding how your users can maximize their productivity while minimizing confusion with both products running side-by-side. Your IT organization learns how to use and manage Teams. Your Change Management and Adoption teams confirm organizational readiness and validate resources and procedures needed on a larger scale prior to your organization-wide rollout. Your users get the benefits of Teams without losing the tools they’re already familiar with. We also recommend that you plan a Teams implementation with Teams. This will build usage skills within the project group who is working on this implementation. Centralizing feedback, resources, and conversations about your Teams experience will help your organization in the long run. Now that you’ve completed all planning and preparation, it’s time to configure your coexistence settings and execute the upgrade. Please refer to Setting your coexistence and upgrade settings (estimated reading time 3 minutes) to understand the different settings. Now that you’ve moved all users to Teams, you need to get sure that the service provides great quality and that users are actually using it. Read Drive operational excellence with Microsoft Teams (estimated reading time 3 minutes) to learn about measuring usage and quality for Teams. Post in the comments section at the bottom of this page. If you need help with planning and deployment, you can request help from FastTrack (you have to sign in). Return to Upgrade from Skype for Business to Teams.